What happens when a large food corporation buys a small, organic yogurt operation? I wish I could say that we get better and less expensive products because now that cute little farm with a name like “rocky plain homestead” has made the whole world a better place. This larger yogurt company can now make healthy, delicious food without relying on toxic chemicals (like persistent pesticides) that harm the environment and public health (like antibiotics). Or does this larger company become simply another marketing ploy to convince consumers that their products are better because they look like the come from a cute little farm? I don’t want to be cynical or flame Gary (the guy who signs the Stonyfield farm label) but what is going on? Notice how they label it “our family recipe”. Adorable! But this family recipe has 39 grams (9 teaspoons) of sugar ! It lacks GMO’s, persistent pesticides, artificial hormones and antibiotics but it doesn’t stand the test of “healthy”. You can make a smoothie at home with far less sugar with my family recipe (which really is a family recipe). What does it look like to you? A chemical? Great, because it is a chemical that they added after they ensured that there weren't any persistent pesticides. Erythritol is a sugar alcohol that will pass directly into the gut making things sweet without any extra calories. It is a form of sweetener with fewer calories. But, because it is indigestible, it can cause bloating and diarrhea. I’m not saying Erythritol isn’t a natural compound – it is. My point is that erythritol doesn’t sound like something that a Rocky Plain Homestead or a Stonyfield Farm would add to its food. Why not - crazy idea here -add less sugar? If Stonyfield was truly committed to public health - they could add less sugar and have a wonderful product that everyone would love. Instead, they added an ingredient that could cause you to feel crappy (not healthy). I have read your blog for several years and respect you for your intelligence. However, I hate the use of the word "chemical" as though it's a monster! As scientists, you and I know that everything is a chemical! I understand your desire to expose the changes to the Stonyfield brand BUT over use the the term "chemical" is just designed to scare people who aren't scientists! The use of the chemical structure emphasizes my point. The high sugar content is bad for enough but I would bet many people have no clue why they have diarrhea after eating some of the products out there. I eat a Low Fodmap diet and spend hours reading food labels so I'm safe. Being on Weight Watchers you learn quickly to pass on all these sugar laden foods, or pay the price . I enjoy your blog and generally agree with the points you make her. But, I was going to post the same thing as Lisa (above). EVERYTHING is made of chemicals. 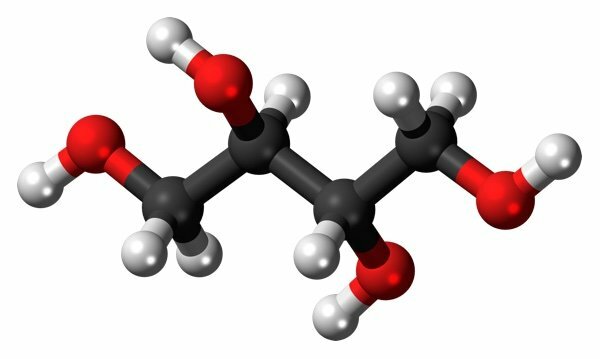 You could also post a chemical model of milk (or the chemicals that make up milk - lactose for example). 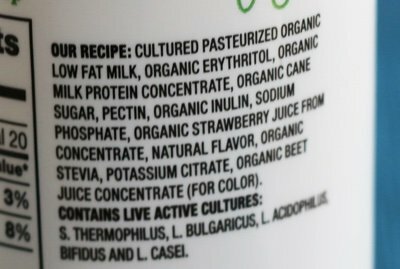 Also keep in mind that yogurt always has naturally occurring sugar, that is, lactose from the milk. I have a container of Stonyfield blueberry yogurt here, and it has total carb of 16 grams, 15 of those are sugars. The label does not break it down further into naturally occurring sugar and added sugar. Regarding chemicals, I agree with you that everything is made of chemicals. 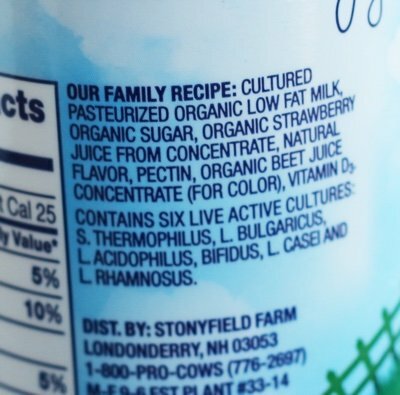 What I am trying to say is that Stonyfield has a reputation for CLEAN food - meaning that they don't add things that we can't pronounce. One buzz word for that type of ingredient is "chemicals". My point - and perhaps I am making it badly - is that they are moving into the world of the unpronounceable when they have a reputation for wholesome. Thanks so much for your comments - as always they make me a better writer, thinker, etc. I don't like erythritol personally, but it is pretty natural as far as low calorie sweeteners go. It can cause nausea in high doses but usually does not cause gas or diarrhea as it does not have laxative effects, and even GI bacteria have trouble breaking it down (so no gas, like you'd get from beans). I prefer stevia or honey to xylitol, and less sweeteners overall. Splenda is horrible for me. But please don't do "chemicals!" fearmongering. I've enjoyed your blog for awhile now, but you might as well tell me you believe in chemtrails or that the moon landing was faked. Everything is s chemical. Fructose (fruit sugar) looks "scary" too as a 3-d model of you dint have a science background. Glycogen or dopamine even more so! They used to use sugar which was changed to erythritol and the second label has added sodium which wasn't in the first one. Why do you need to add sodium??? Sodium is over used in so many products! I'm glad to see those that have posted regarding the chemical structure. I am a health-conscious pharmacologist and am really sad when I see healthy-eating blogs that vilify "chemicals" that are present in absolutely every organic presence on earth. While it can cause some adverse side effects in some (lactose anybody? ), erythritol is found naturally in some foods, and cannot cause sugar spikes or tooth decay. So for a chemical, it's not all that bad if your stomach can tolerate it. Also, it is important to point out that "natural" or plant products are not always safe, and industrial "chemicals" comprise some of the most important medicines we have available in modern medicine. Acetylsalicylic acid - hard to pronounce maybe- but aspirin is one of the most groundbreaking discoveries that has saved countless lives. And as an aside, yogurt/smoothies are often high in sugars or natural sweeteners, and as such they are treats. Of course you expect them not to rank high on the healthy food index. I'm angered by this post. I believe in freedom of speech and the right to post on any topic that you want, but I feel this one is misinformed. Kudos for removing the veil. Sugar is really a public health problem, and although it is on the label and so not hidden, the use of the 'family recipe' is indeed duplicitous. The whole presentation leads one to think that it is healthy despite having more sugar than a Snickers bar. the only power we have as consumers is to stop buying products that are not good for us - opting for better choices, because there are options. Yes that added sugar might be a natural product but just because it's natural doesn't mean it's very good for you. Hemlock is a natural product but I don't think I'd be eating that! A few days ago I treated myself to a yogurt from a local dairy farm. The very first bite reminded me of yogurt from my childhood. I hadn't even noticed that yogurt no longer tastes great. It costs about 3 times what a "factory" yogurt costs. I might have to make the switch permanent. I wantless sugar. 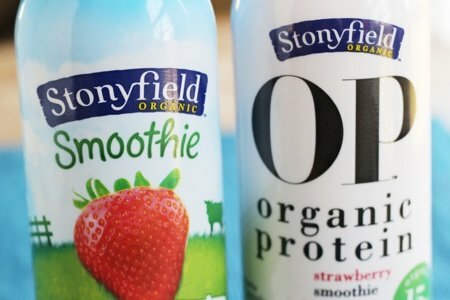 Stonyfield's amount is much less than other brands. I use the plain low fat and only add fresh fruit. I appreciate the heads up...if I can't make something in my own personal kitchen... It's not food..end of story. I'm thankful for your post. Please don't feel discouraged by other ppl who post...they want something healthy quick. So this is good enough... Well anyone living in the real world and not the material world there is always time to care for yourself and treat your body right.. If ppl say they don't have time to grab an apple instead if they want healthy...then I feel sorry for them..please know your post are still loved by the inlazy ppl who still care.. Went to a workshop today and had a Stonyfield Yogurt for breakfast. Later on was experiencing bloating and gas. Did research online because I couldn't figure out "what in the world did I eat today to create this discomfort". Now I know, won't be eating this brand of yogurt anytime soon!